"You never know where I'm going to pop up next." Drill Master is a very levelheaded Cybertronian and hard to phase. Despite his duties as a drill tank, Drill Master would prefer to be scratch free and freshly waxed. He dislikes messiness and can often times be seen dusting a weapons control console in the heat of battle. However, his attitude doesn't take away from the quality of his abilities and duties. After a battle with the Autobots, he and several other Decepticons were severely damaged and believed to be dead by his fellow Decepticons. 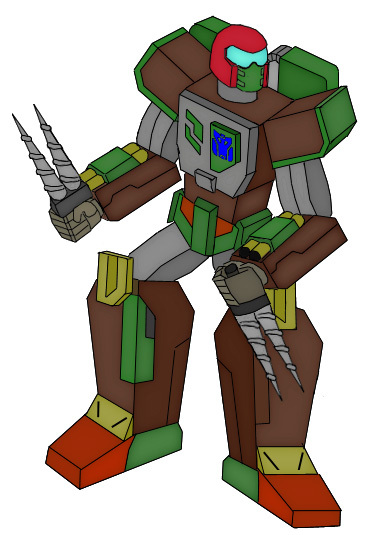 He soon awoke with heavy upgrades to his system and body and noticed that out of the Decepticons that died that day, the only ones that had been saved were Scamp and himself. He later learned that Dark Star had rebuilt his body and saved his life. Drill Master is an expert in ninjitsu which he demonstrates through his usage of his two-pronged drill forks in robot mode. He is also able to shoot energy projectiles from the middle of his drill forks. 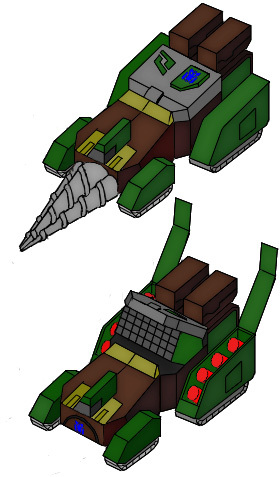 For long range attacks, Drill Master uses a standard issue laser pistol and a triple-thick armored shield. In drill tank mode, he is extremely powerful. His power is demonstrated whether it be drilling through wall or beneath the surfaces of numerous types of planet surfaces, even Cybertron's. In missile launcher mode, nothing can escape his onslaught of missiles. He's not a very good shot, but with 20 launching missiles, no one seems to notice. Drill Master also forms the right leg of Razer. He is probably the only Cybertronian with the ability to ignore Scamp's ego. Drill Master is the only one who honestly understands Scamps feelings and even agreed to leave the Decepticons due to Scamp's reasoning that the Autobot/Decepticon wars were pointless. The same holds true with his reasons for joining LONAC. Some time after joining Drill Master was once again rebuilt as a triple changer to better assist LONAC in its battle against increasing alien threats.